No matter where your institution is in developing a Digital Humanities program, there are opportunities for funding across national and international sponsors, program objectives, and your applicant population. What is the Digital Humanities (DH)? There is no single definition, but in a general sense, DH is the application of digital research methodologies and analysis afforded by the use of technologies in humanities disciplines. DH is cross-disciplinary and collaborative, involving researchers in areas like history and linguistics alongside colleagues in data mining, indexing, and visualization. There are hundreds of examples of projects including those found at the Center for Digital Research in the Humanities at the University of Nebraska-Lincoln and disciplinary collections like the growing list of Geographical Information System (GIS) projects found on the Anterotesis blog. No matter how you define it, DH is on the rise in Universities and research organizations around the world. Amidst budget cuts academic positions in New Media and Digital Humanities have surfaced at an increasing rate in institutions large and small. As a growing, multidisciplinary research area, funding in DH can be lucrative, especially for creative researchers and research administrators. 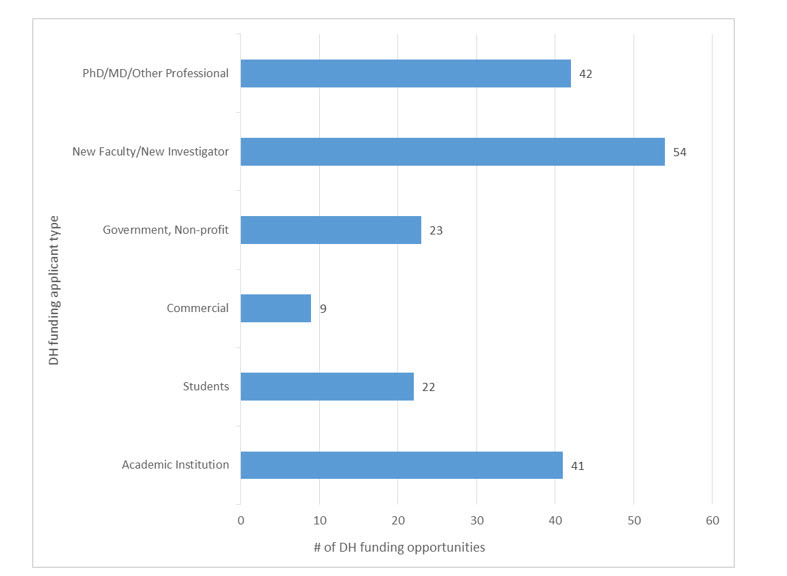 Using Pivot, we can dissect and examine the scope of funding in DH across sources. 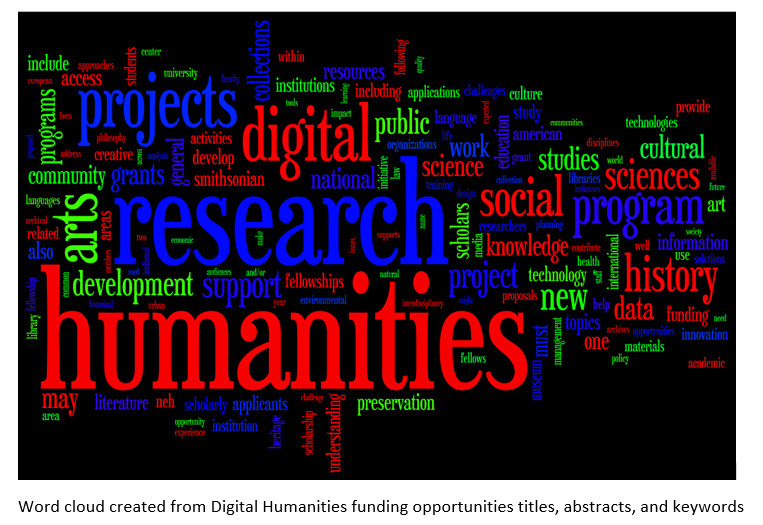 As of June 1, 2016 a specific funding search for digital humanities and “digital humanities” returns 115 unique results for current and anticipated funding. Funding sources include: The National Endowment for the Humanities; Humanities, Arts, Science, and Technology Alliance and Collaboratory (HASTAC); European Union Horizon 2020; Government of Canada Social Sciences and Humanities Research Council of Canada (SSHRC); and the Research Councils UK (RCUK) Arts and Humanities Research Council (AHRC) as well as multiple Universities, corporate sponsors, non-profits and other national research initiatives. A majority of these opportunities are directed towards professionals or academic institutions in general and “New Faculty/New Investigator” awards. It is important to note that 20% allow for student applications and another 20% government or non-profit. In addition to these 115 specific opportunities, DH projects can also be funded or awarded by larger collaborative grants and humanities-related funding programs in other disciplines. This includes things like the T-AP Digging into Data Challenge, the Lanzendorf Paleoart Prize, the Humanities Collections and Reference Resources (HCRR) Program, or the EIT Digital Challenge, and other opportunities in visual arts and data visualization, software development, content digitization and dissemination, exhibition/catalog development and touring, publishing, and career development. There are also hundreds of discipline-specific grants that can be used for digital projects and, if we generalize applicant and funding types, thousands of opportunities that could be applied to DH initiatives. 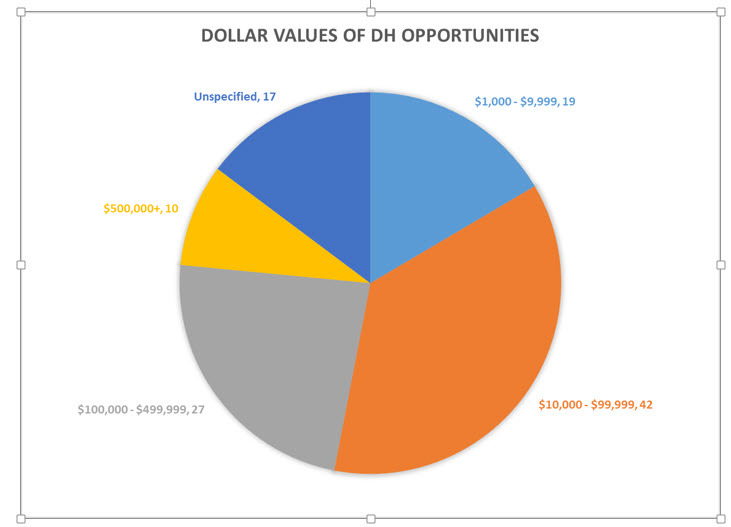 Regardless of where your institution is in developing a DH program, there are opportunities for funding across national and international sponsors, your applicant population, and program endeavors. By focusing on disciplinary funding resources that can be applied to digital projects or including humanities applications to enhance digital projects in other disciplines, you can open up your Digital Humanities initiatives to a variety of potential new programs. To receive a Pivot Shared List of the funding opportunities discussed above, please email Jeremy McLaughlin.